A wicked reflection on victimization in the age of snowflakes. LONDON – For many adults, the image of a cane dredges up the memory of unpleasant childhoods, a symbol of punishment, fear and judgment. But as the years have gone by, corporeal punishment has in turn gone out of vogue, leaving the physical cane very much a thing of the past, becoming a hollow reminder of the old, extinct ways. In Mark Ravenhill’s The Cane, the titular tool however, takes on far more symbolism than one might expect. Directed by Royal Court Artistic Director Vicky Featherstone, The Cane follows celebrated senior teacher and former disciplinary head Edward (Alun Armstrong) as he is about to retire, but absurdly, finds himself trapped in his own home for the past six days with his wife Maureen (Maggie Steed, high strung, nervous but indignant nonetheless), while a mob of angry students riot outside. 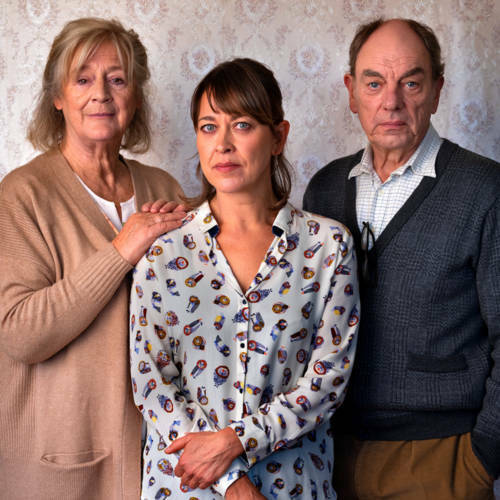 When his estranged daughter Anna (Nicola Walker) arrives suddenly, old secrets are revealed and old wounds reopened. 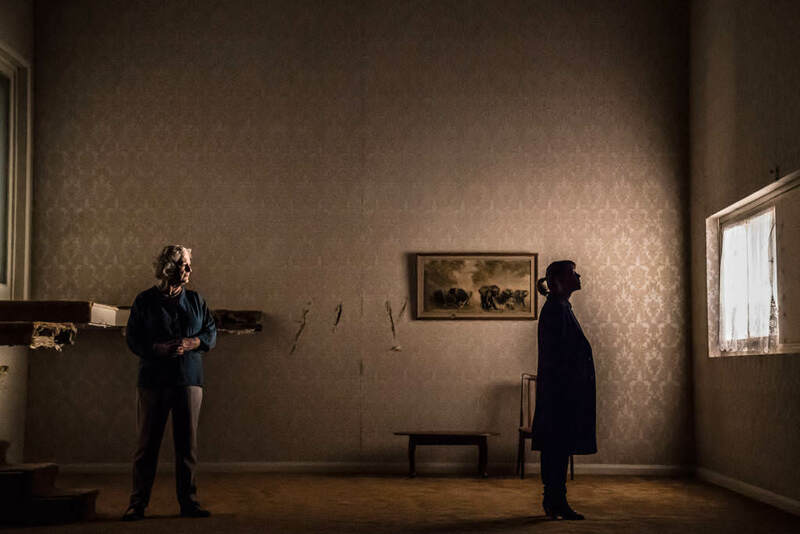 With its somewhat absurd premise, Ravenhill takes the opportunity to allow his characters to share outrageous histories – Anna, as a child, is filled with an uncontrollable rage as she attempts to behead her father with an axe, while in her adulthood, both Edward and Maureen are cold and utterly dismissive of her, unable to let a moment slide without letting slip a snide comment. This is a family broken beyond recognition, and one that no longer meet without wanting to destroy each other. For the most part however, Edward’s family politics act as a distraction from the greater issues at hand that The Cane wishes to deal with. Entangling deadpan delivery and biting sarcasm, one is left with nervous laughter as we watch the family politics further complicated by Edward’s past as a discipline master, and his use of the cane in meting out punishment to school miscreants. 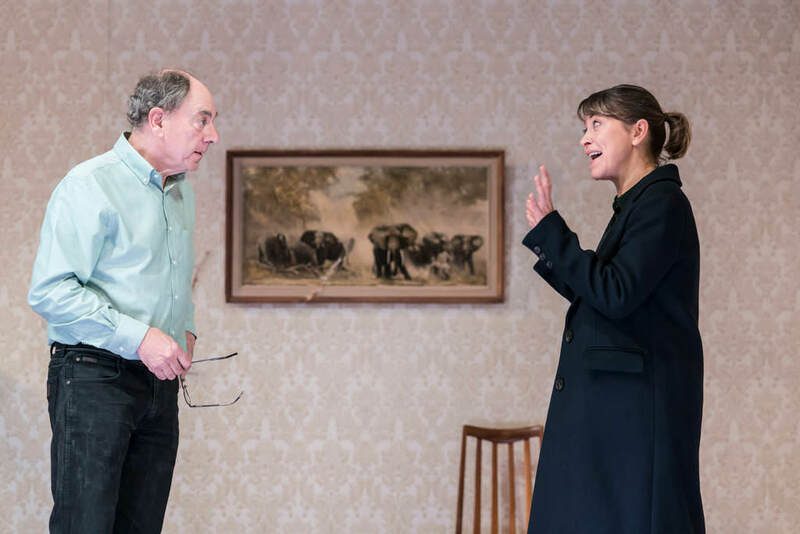 Alun Armstrong delivers a ferocious, terrifying Jekyll-and-Hyde performance here as he transforms from a tame retiree to a quietly fearsome disciplinarian, where one can almost see a complicated mix of glee, power and regret erupt in his eyes as he reminisces on the old days. 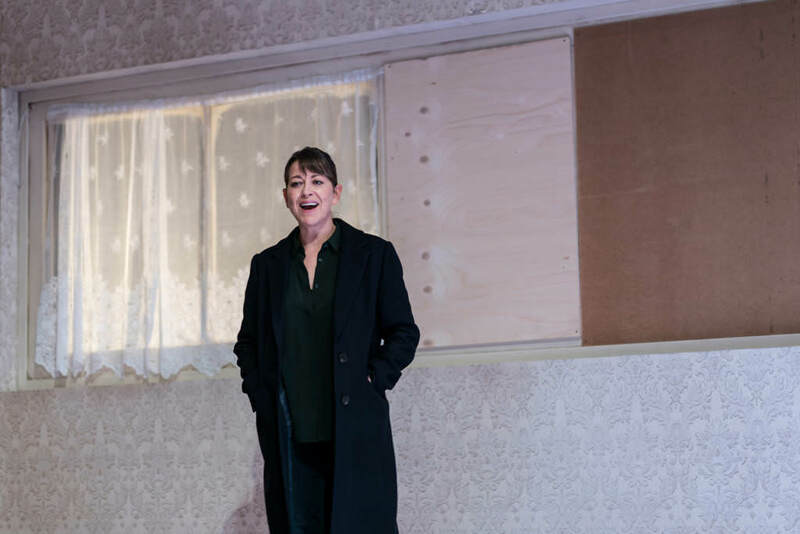 Chloe Lamford’s set initially, feel almost absurd: a sparse, almost completely bare, wallpapered living room whose ceiling stretches tall, all the way to the Royal Court’s roof. One gets the sense that these characters are but pawns in a far greater scheme as they are left dwarfed by the set’s sheer height. 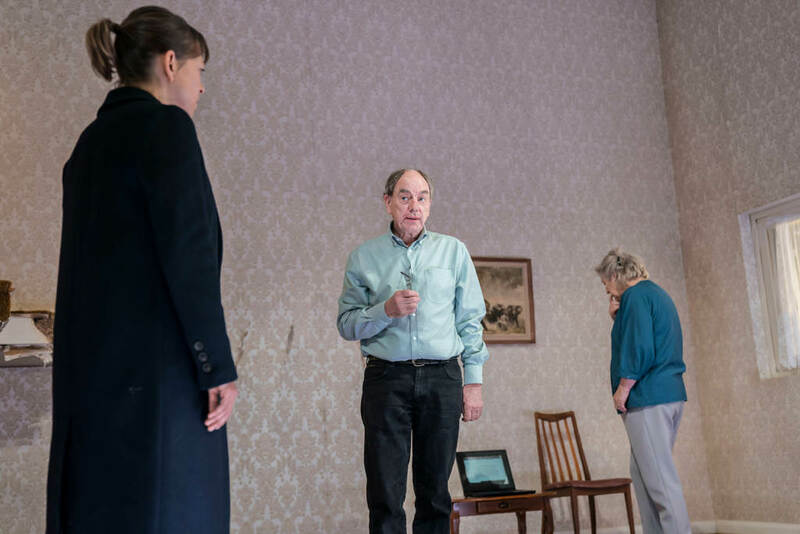 Over the course of the play, this ceiling gradually lowers, threatening to crush its inhabitants by its end with its increasing claustrophobia as the tensions in the script similarly rise. 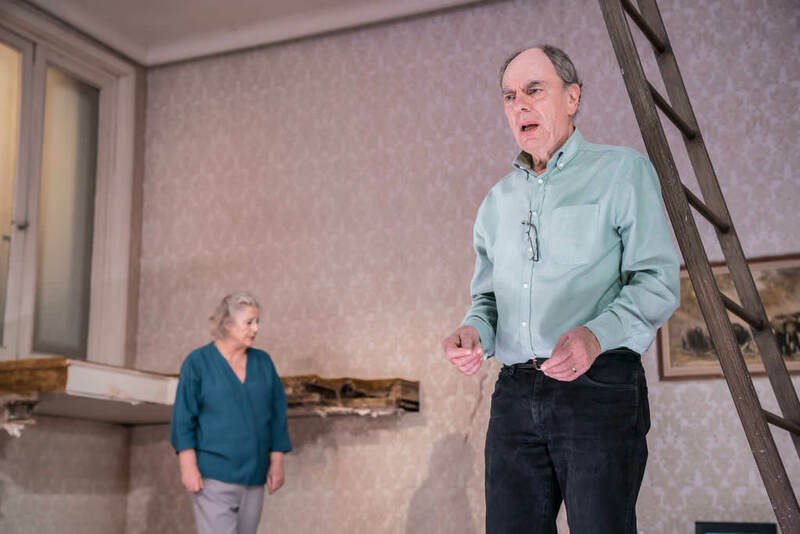 In between scenes, Natasha Chivers’ lighting shines directly at audiences, as if caught momentarily like deer in headlights, perhaps to illustrate just how blind and obtuse our line of sight can be the more we shut out alternative points of view. Part of the reason for this is also our changing allegiances with each character. 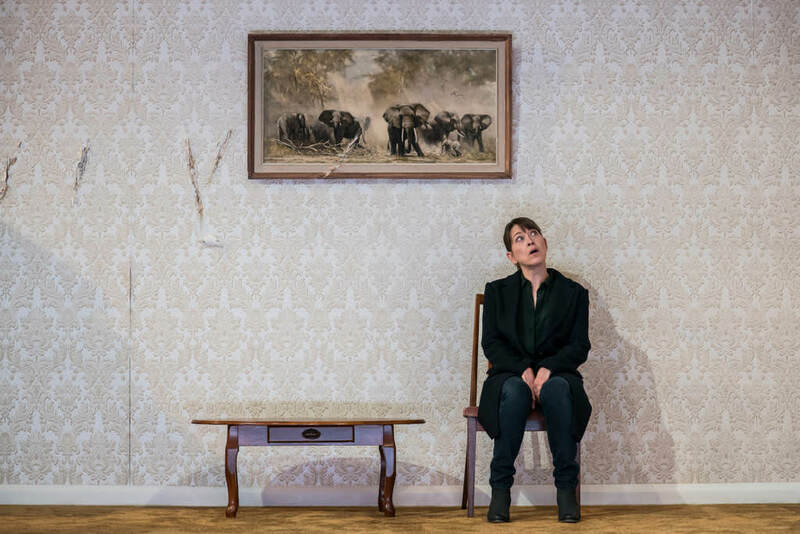 We are initially sympathetic to Anna for how she is shunned by her own parents, but later shocked at her irrational behaviour as she entraps and doles out revenge on them, practically villainous in her ability to lie through a straight face. Vicky Featherstone does a remarkable job of maintaining a taut tension throughout to keep the action unpredictable and audiences on edge, but one is ultimately left lost in the shifting grey morality of The Cane, where the resonance of the cane as a scapegoat for the ills of the current generation is diluted by its inability to stand up to scrutiny, a weak argument that falls apart quickly once dissected. But then, perhaps that is precisely the purpose of The Cane; one could interpret the weakness of the cane as a scapegoat as an extended metaphor for the problems of the far left, and the dangers of when liberals reach militant extremes. When one buys into an ideal so completely, then both morality and culpability are thrown out the window as the masses bay for blood and relentlessly pursue their end goal. It is only when the mark is finally hunted down and destroyed utterly that the angry mob will finally be appeased, a symbolic death of the old ways as we eke out a violent modern ‘justice’ and move on at last from the past. 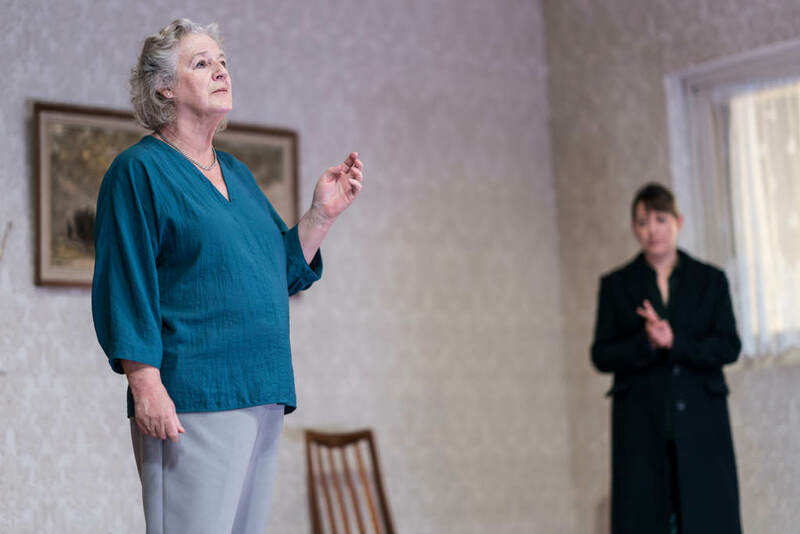 The Cane played till the 26th January 2019 at The Royal Court Theatre, London.